It’s hardly an ideal time to be marketing a film in which two average Joes abuse the civil justice system by imitating US police officers. 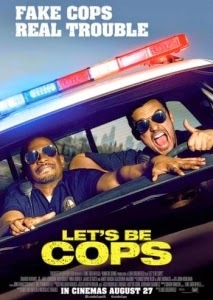 With the tragic fatal shooting of Michael Brown in Ferguson, Missouri still very much in the news, Luke Greenfield’s gross-out buddy comedy Let’s Be Cops (2014) now finds itself in the unenviable position of having to make law enforcement officials – or those willing to impersonate them at least – humorous again. Not only does Greenfield’s barrel-scrapping head-banger fail to illicit enough laughs from those who consider themselves post-pubescent to warrant the ‘comedy’ tag, but it’s also one of the most morose and insensitive mainstream releases of the year thus far. Steve Guttenberg-in-waiting Jake Johnson (of TV’s New Girl fame) and Damon Wayans Jr. (son of stand-up Damon Wayans Sr.) play gruesome twosome Ryan and Justin, a pair of slack-jawed man-children in the midst of an existential funk. Ryan’s dreams of becoming an NFL superstar were cruelly snatched away from him in the wake of a career-ending injury, while Justin is a lowly ideas man at a games design company. Bowling up to a masquerade party dressed as LAPD cops – using props hoisted from Justin’s office – the duo quickly begin to see their choice of attire paying dividends. From fawning women to cowering hoodlums, this newfound sense of authority gives Ryan and Justin a needed ego boost. However, it’s not long before the lie grows to gargantuan – and life-threatening – proportions. From assaulting women to the ugly return of the “ah-so” school of East Asian mimicry (the name badge on Justin’s uniform states ‘Chang’ – enter running gag), Greenfield’s Let’s Be Cops leaves few taboos unscathed in its quest for cheap guffaws. Adopting the Judd Apatow bromance template that now appears to be a requisite of male-centric mainstream comedies, Johnson and Wayans Jr’s inseparable idiots initially use their law enforcement status to molest women, before getting so carried away in their adopted roles that they find themselves in the middle of an arms trafficking ring headed up by generic Eastern European gangster Mossi (the bizarrely cast James D’Arcy) and the corrupt Detective Brolin (Andy Garcia). That every antagonist in the film is an immigrant of some description is troubling. That none of them have the merest shred of back story is arguably even worse. A shameless composite of the infinitely more sophisticated 21/22 Jump Street and those sections of 2007’s Superbad where Christopher Mintz-Plasse’s nerdy teen Fogell (aka “McLovin”) becomes an honorary cop for the day, Let’s Be Cops is a one-note, single-celled amoeba of a summer movie that’s not even humorous enough to disguise how hateful it actually is. Racist, sexist and offhandedly homophobic (Justin may be a fraud, but at least he’s not gay – as Nina Dobrev’s skimpy clothes horse/love interest Josie briefly assumes), Greenfield’s abysmally judged copycop caper serves only as a timely reminder of how wrong comedies can go with a jobbing director, a charisma-less cast and a warped moral code.